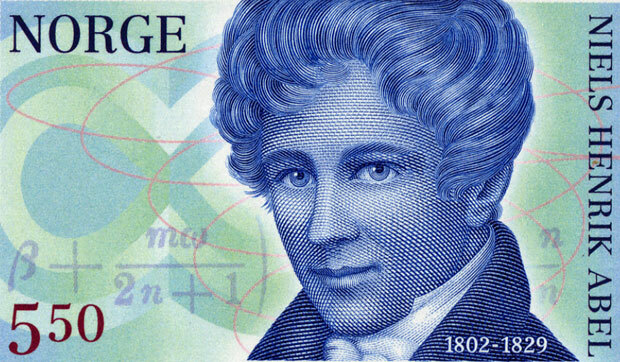 Niels Henrik Abel was a Norwegian mathematician, born on 5th August 1802 in Nedstrand, Norway. Niels went to the Cathedral School at 13 in 1815. His teacher, Bernt Michael Holmboe recognized his talent in mathematics and encouraged him to study the subject at the advance levels also tutoring Niels after school privately. Niels family underwent a severe crisis after 1818. Niels father died and as a consequence the family fell apart both emotionally and financially. Bernt Michael Holmboe helped Niels with a scholarship so he could stay in school and his friends raised enough money so Niels could apply to the Royal Frederick University. By the time Niels started university in 1821 he was already one of the top most mathematicians in the country. His first mathematical achievement was the ‘quintic equation’ in radicals, a problem to which mathematician had been unable to find a solution to for over two centuries now. After the solution by Niels had been approved by the leading mathematicians of the time, Professor Ferdinand Degen, a prominent mathematician, stated that Niels should not be wasting time with such minor problems but go on to more advanced elliptic functions and transcendence. After Niels graduated, he had no place to live. His university professors helped him monetarily so he could find a place to stay. But his financial crisis did not stop him from working on his mathematical ambition. His first article ‘Magazin for Naturvidenskaberne’ was published in 1823 in Norway’s scientific journal. Many articles followed before he realized he wanted to do more than this. In 1823, Niels went to Copenhagen with the help of his professor who gave him the money for travelling. There he met with many leading mathematicians and also worked on ‘Fermat’s Last Theorem’. On his return from Copenhagen, Niels applied for a scholarship so he could travel further to meet the mathematicians in Germany and France. However after he was offered 200 speciedaler annually to study the German and French language, Niels decided to stay in Chrisitiana (now Oslo). Niels most notable work was ‘Mémoire sur les équations algébriques où on démontre l’impossibilité de la résolution de l’équation générale du cinquième degré’ (Memoir on algebraic equations, in which the impossibility of solving the general equation of the fifth degree is proven), published in 1824. Niels also contributed to many journals throughout his career including ‘Journal für die reine und angewandte Mathematik’ for which he wrote seven articles and ‘Crelles Journal’. His research in ‘theory of functions’ led to a new form of functions known as the ‘Abelian functions’. His most significant work was for the French Academy of Sciences and it was a theorem on the addition of algebraic differentials. Niels remained in a financial constraint throughout his life and this prevented him from fulfilling many of his dreams even though he did have a lot of help but it was not enough for achieving all his plans. He was the inventor of the group theory and gave proof of the binomial theorem. Niels died due to tuberculosis in Paris on 6th April 1829.